I usually by this myself for £12. Dettol Big & Strong Wipes eliminate 99.9% of viruses and bacteria* found on kitchen surfaces. Get tough on grime, grease and burnt on food with the easy to use wipes, ideal for quick and easy cleanup. 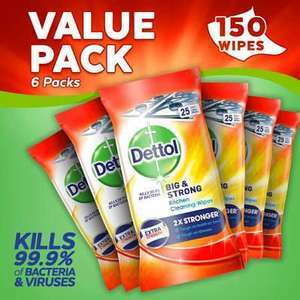 I got the 'Dettol Antibacterial Surface Cleaning Wipes, 756 Wipes, Pack of 6 x 126' for £11.56. Not sure if there's much difference between the two? I got the 'Dettol Antibacterial Surface Cleaning Wipes, 756 Wipes, Pack of …I got the 'Dettol Antibacterial Surface Cleaning Wipes, 756 Wipes, Pack of 6 x 126' for £11.56. Not sure if there's much difference between the two? Bought those again, makes sense as they are big enough for most jobs, anything more than that and I blast Dettol spray on some kitchen roll. They last a lot longer.